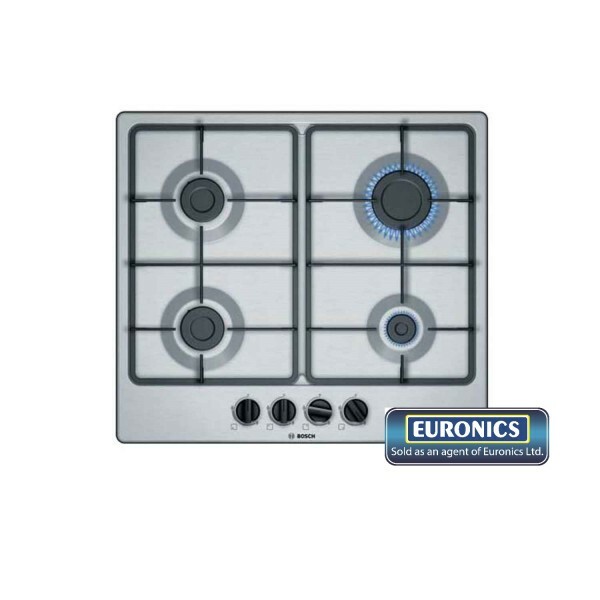 Product information "Bosch PGP6B5B60 4 Burner Gas Hob"
With a modern design and plenty of cooking power, the Bosch PGP6B5B60 hob is a great addition to your kitchen. Still the preferred fuel for many people, including professional chefs, gas hobs give you greater versatility and are more responsive than electric models. The Bosch PGP6B5B60 gives instant heat, allowing you to start cooking as soon as you ignite the burner. Gas is also a cheaper fuel than electricity. The Bosch PGP6B5B60 not only gives you a great cooking experience but also saves you money. Four spacious burners offer plenty of room to cook with multiple pots and pans at once. Giving you even greater flexibility, the burners have three different power outputs. The economy, normal and high speed burners provide 1 kW, 1.75 kW and 3 kW of power respectively. Choosing the right burner for your dish helps you cook more efficiently. The controls are integrated into the front of the hob so you don’t have to reach across the burners to adjust the flame. They also have mains powered auto ignition meaning you can easily turn on a burner with one hand whilst holding a pan in the other. The Bosch PGP6B5B60 model is fitted with a flame failure device which automatically shuts off the gas supply if the flame is extinguished - this will help to keep your mind at rest in case of any problems. Related links to "Bosch PGP6B5B60 4 Burner Gas Hob"
Customer review for "Bosch PGP6B5B60 4 Burner Gas Hob"